Mindika Moments: Thanks Panda Express.. Although I love to cook and I have an excellent recipe for my own orange sauce, like most moms out there my life is very busy. I have nights that I don't have time or just don't feel like cooking. 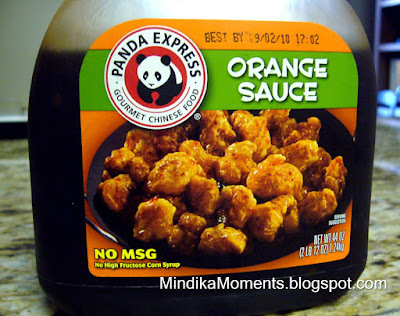 That's why I was so excited to see that Panda Express has started selling their famous orange sauce in a bottle. Even better; it's at Costco for a screaming deal. It also has no MSG, no high fructose corn syrup and it's fairly low in calories. Only 35 calories per tablespoon. So on a busy night I can quickly stir fry some chicken and veggies, drizzle a little sauce, serve over rice, and dinner is done. Not to mention its much healthier than the deep fried chicken at Panda Express. OH! I am so there! Thanks for the info!! They also sell a small bottle at Harmons that I snapped up when I saw it! I agree some nights you just need easy! How'd I miss that? I NEED! We had one of Panda Express sauces mixed with ground turkey in lettuce wraps with a few other toppings. Yum!